This is the French version of Joannes Sambucus Emblemata, published in Antwerp by Christophe Plantin. 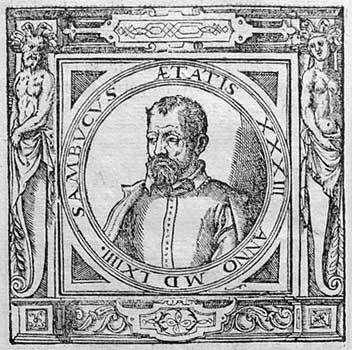 The translation was the work of the Paris dramatist and physician Jacques Grévin. The work was originally published in Latin by Plantin in 1564. The French version was produced simultaneously with a Dutch edition prepared by Marcus Antonius Gillis van Diest. Both these books were based on the first Latin edition from 1564. In fact, it seems that Plantin commisioned both translators when the Latin edition was still in the press, since the first payment for their work can be noted as early as September 1564. Grévin worked quickly, finishing his translation by the end of the same year. The fact that the book only appeared two years later, may be related to commercial considerations. Presented here is the first and only French edition of Sambucus emblems, straightforwardly entitled Les emblemes du signeur Iehan Sambucus. Traduits de Latin en François. Although the title pages gives 1567 as the year of publication, the records of Plantins business show that printing was finished by 1566. The work is based on the first Latin edition, with some small changes in form and content. The format is reduced from the octavo of 1564 to the smaller sextoidecimo size. The preliminaries consist of a preface to the reader by Christophe Plantin, while the introduction into the emblem from the Latin edition is omitted. Also removed is the section with ancient coins. The main body of the book contains 165 emblems, two fewer than in the Latin edition (Conscientia integra pp. 14-15, and Docti ignavos reprehendunt pp. 17-18 of the Latin edition). GUL: SMAdd429: A7v-A8r. Actual page height: 122mm. The order and dedications of the Latin edition are preserved. In translating Sambucus humanist, heavily classicized Latin into contemporary French, however, Grévin frequently makes his own mark, resulting for example in more direct religious language (Adams 1997). Leon Voet, The Plantin Press, 1555-1589 : a Bibliography of the Works printed and published by Christopher Plantin at Antwerp and Leiden (Amsterdam: Van Hoeve, 1980-1983) vol. 4, 2147.